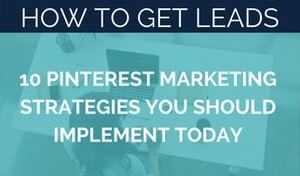 Pinterest is one of the best social networks for getting free traffic. Pinterest is not just a social network; it is more of a search engine. 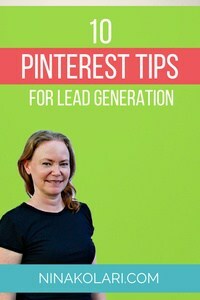 Pinterest is great way to get traffic and eye balls for your content and best thing is it’s free! Facebook is nowadays pretty much a pay-per-show network as they restrict post visibility to get you to boost posts. That does not happen on Pinterest! Pinterest is especially great if your target market is women as majority of users are women, but men are finding Pinterest and joining in masses. Third of my audience reach is men right now, and growing fast. Majority of business profiles are by women entrepreneurs giving a distinct advantage for men to sign up with Pinterest and take over the market! To be visible on Pinterest, here are my tips how to get most out of it. Pinterest profile is your home or business card and it requires attention. Firstly complete profile with your “elevator pitch” and great photo of you. Don’t forget to use keywords your clients/customers would be using when searching for services/products you offer. One of first things you should do is reserve custom URL for your business/name. Use same custom URL that you have in all other social media to ensure you only have one slug you give out. 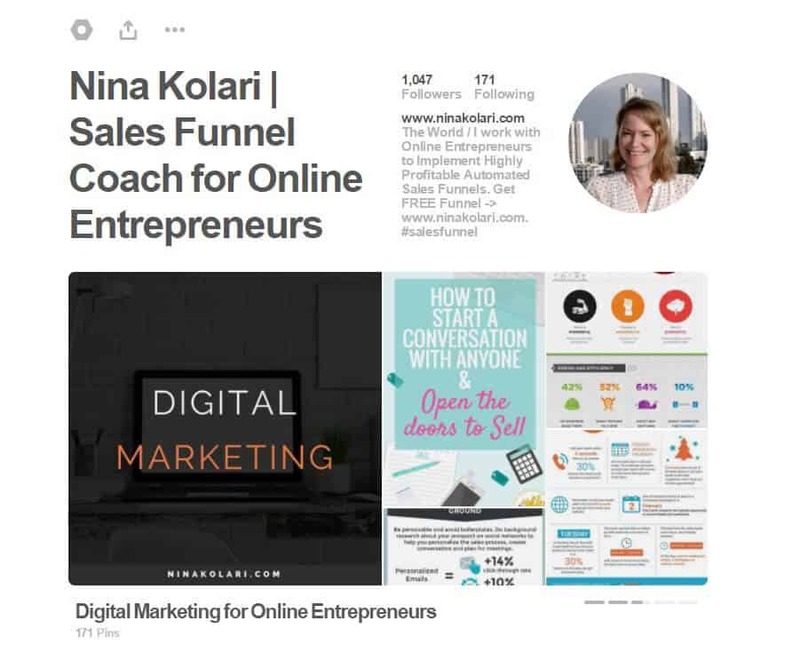 Mine is pinterest.com/ninakolaricom <- Click to connect with me on Pinterest. Boards are collection of pins and great way to divide your pins based on topics. It is recommended to add main images for your board to make it easier to see what the board is about. You can create these quickly and easily with canva.com. I am using my brand colors white, black and orange in my main images. Add pins to all new boards at least 10 to start with. You can make a board secret if you are still working on it and finding suitable pins. Organize your boards based on popularity, keep popular once at the top. Be little bit critical with what you pin! Don’t pin just anything, pin high quality content from you and from others. Do not pin only your content – followers will get board quickly and many won’t pin yours. Pinterest is all about collaboration – pin mostly other people’s pins! When creating your own pins, always use vertical pins, horizontal pins do not look good on Pinterest. Use images, typography and colors to stand out from the crowd. Again canva.com is great tool to create pins, they have a Pinterest pin template ready to use. When creating a pin always add description, pin title and domain. Do not use shortened URLs like bit.ly – use your own full domain. Visibility on Pinterest requires effort and it is highly recommended to use an automation tool that does all the work for you! More the merrier is good quote for Pinterest! You should pin consistently all day long. 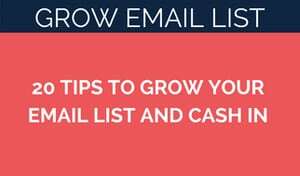 But it is hard to do manually… Invest into automation tool that reduces Pinterest management to max 1 hour a week! That is pretty awesome considering how much traffic Pinterest can bring to you. 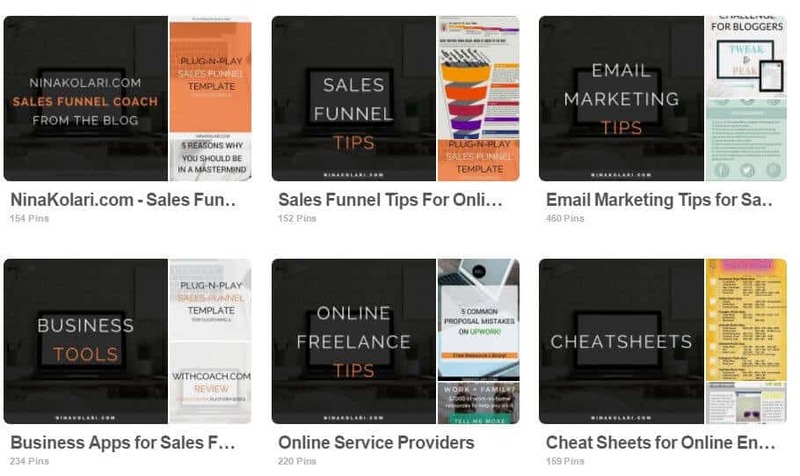 I personally use two automation tools with Pinterest – Tailwindapp & Boardbooster. I started with Tailwindapp but lately have been playing around with Boardbooster. Of the two, Tailwindapp is much easier to get started with. Boardbooster has great tools but I find user interface a little complex. I recommend trying both and seeing which one works best for you. My preference is Tailwindapp but I know many love Boardbooster. 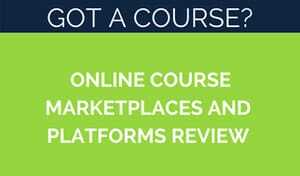 You can get free trials with both Tailwindapp & Boardbooster if you click links above. One of the great things about Tailwindapp is their Tribes – you can join a tribe of like-minded people/in similar niche and collaborate to ensure everyone gets most out of Pinterest and higher visibility. 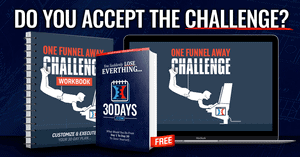 Join my Digital Marketing Tribe.